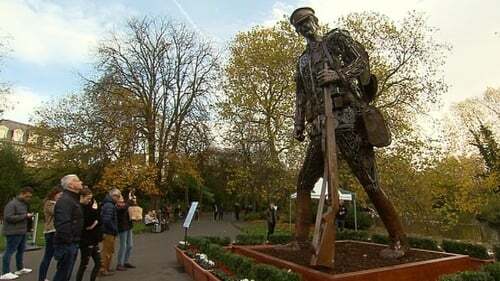 Hundreds of people have attended an event in Dublin to mark the arrival of a six-metre high sculpture of a World War I soldier in St Stephen's Green. The sculpture, named 'The Hauntings Soldier', represents a soldier returned from war, battle weary and forlorn. It will remain in St Stephen's Green until 26 November and has attracted huge interest since it was installed yesterday afternoon.